This is the perfect end to a dinner party, and the leftovers heat up great if it's just for you. This is the perfect end to a dinner party, and the leftovers heat up great if it's just for you. Bread pudding is never going to win a beauty contest, but this one is moist and flecked with nuts and chocolate. The apple brandy adds to the complex flavor of this delicious dessert. This recipe, like some of the others in this chapter, begs for seasonal fruit. Try a berry bread pudding or peach and pecan with a little bourbon; the list goes on and on. 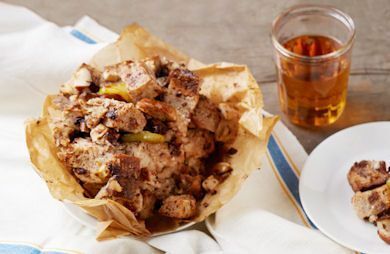 Oil your slow cooker crock or **line with parchment paper to make recipe oil-free. Soak the bread in a large bowl with the apples, 1/2 cup (120 ml) of the milk, apple brandy, flaxseed mixture, and sweetener for about 10 minutes. Add up to 1/2 cup (120 ml) more nondairy milk if the mixture is too dry. Mix in the nuts and chocolate and then scrape the entire mixture into the slow cooker. Cook on high for 1 to 2 hours.